Could you set up electricity at a base out in the field? Or get emergency power up and running in a blackout? 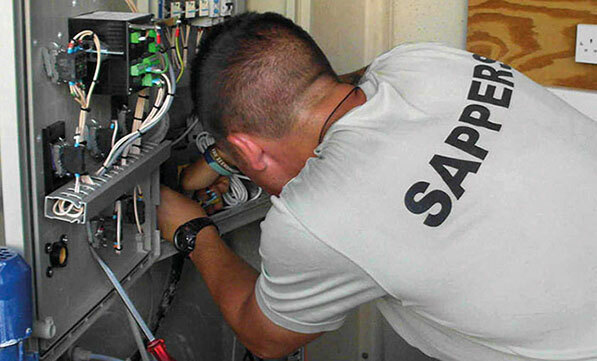 These are the kinds of tasks you’ll handle as an Army Electrician. With our first-class training, you’ll soon become qualified. You’ll learn about electrical engineering, low voltage underground cables, alarms and power generators. You can also get trade qualifications and your driving licence. This can open up other jobs in the Army and the civilian world. Wherever you’re based – in the UK or abroad – you’ll have good mates around you and an exciting, active life. Then it’s off to the Royal School of Military Engineering Regiment near Camberley for ten weeks. Here, you learn military engineering skills such as knots and lashings, demolition, mine warfare and bridge building. Finally, you go the Royal School of Military Engineering in Chatham for 33 weeks. Here, you learn about wiring systems, electrical technology and power generation.